This is certainly something that you wouldn’t think of right away, nor would it seem like a viable option. But Scrott Brusaw and his team are committed to their project and as it gains more steam, the possibility of it becomes more and more real. 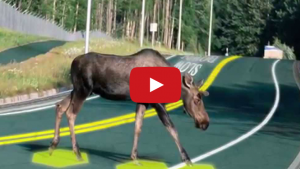 Solar Roadways are exactly how it sounds, roadways that are made of photovoltaic solar panels. Essentially, the vision promises to cover asphalt roadways across north America with these specially made solar panels so that roadways are not only suitable for driving but can also provide a great deal of electricity generation. Scott Bursaw, inventor of Solar Roadways, began putting his idea into motion when The US Department of Transportation released a solicitation for an intelligent pavement that could generate power. After applying and receiving funding for his project, Solar Roadways became a reality and a prototype was built. Scott knew that given the surface would be made of glass, it would have to have the same traction as asphalt and be able to withstand fully loaded transport trucks driving along them at full force. Regardless of these apparent challenges, research in glass manufacturing led him to understand that glass can be manufactured to be as strong as steel. The final prototype cost about $7000 to build but was a masterpiece when complete. The roadway featured 15% efficiency solar panels, and contained LED lights throughout that would not only light up the road but could display warnings and messages to drivers while driving. The support structures for the panels were made up of garbage that was reduced down to pellets and mixed with organic materials to form a structure; a feature that could have a big impact on waste removal. Throughout the solar panels was wiring that would be capable of delivering power directly to homes and businesses along the road. Cable TV, High Speed Internet and phone could also be accommodated by the roadway. With the continued use of 15% efficiency solar panels in the roadway, covering roadways in the US now with this technology would produce more than 3 times that amount of power the US currently uses each year. It would also cut down on the need for oil as asphalt today is petroleum based. The cost of the roadways, given the current cost of the technologies involved, is quite high. It is believed that as solar technology continues to expand, the cost of solar roadways would drastically reduce. It’s important to note that asphalt costs have gone up greatly in the last few years. In the late 90’s and early 2000’s, asphalt rose about 1% each year in price. That number has jumped to 12% each year since 2006. From about $300 per 2 lane mile road in 2003, we are now seeing prices near $1000 per 2 lane mile road. The main advantage of the solar roadway concept is that it utilizes a green and renewable source of energy for electricity production. This of course reduces our dependence on conventional sources of energy such as coal, petroleum and other fossil fuels. When looking at the life span, solar roadyways can last 30–40 years which is much greater than asphalt roads that only last 7–12 years.